VALENTINE DAYZ is a heart-stopping horror comedy written and directed by Mark Allen Michaels. Revisiting his unique blend of hardboiled crime thriller and brutal, bloody horror comedy, Michaels’ VALENTINE DAYZ takes his characters on a journey from the champagne and yacht lifestyles of the rich and corrupt, to doom and despair in Death Valley as the zombie apocalypse threatens everything they hold dear. The film stars Carrie Keagan (SHARKNADO 4, The Fiancé) , Dallas Valdez (The Fiancé, Mind Rage - The Director's Cut) and Robert Allen Mukes (House of 1000 Corpses, Westworld), Diane Ayala Goldner, and Curt Lambert. VALENTINE DAYZ will be distributed by Nacelle Co./Comedy Dynamics. 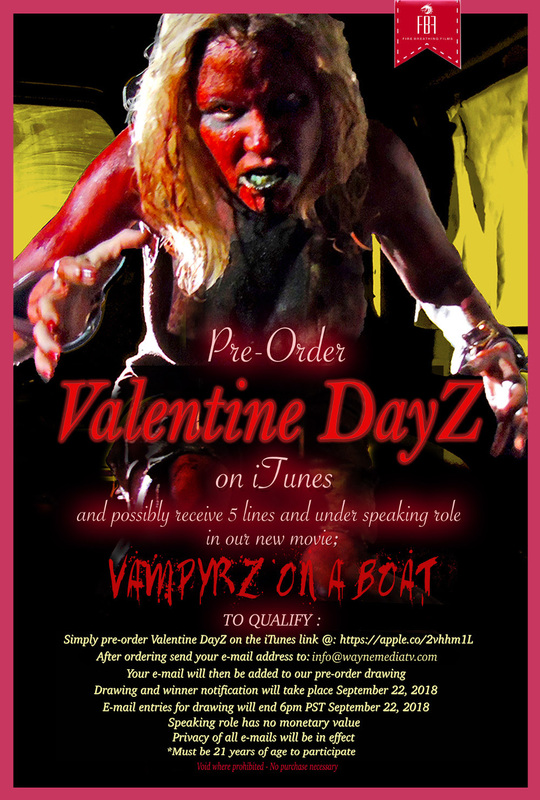 If you pre-order VALENTINE DAYZ on iTunes and follow the rules in the poster above you could be in with a chance of having a speaking role (5 lines or under) in the filmmakers next project VAMPYRZ ON A BOAT. Valentine DayZ Trailer from Firebreathing Films on Vimeo. Pre-order VALENTINE DAYZ now on iTunes via the link below and don't forget to get your entry into the competition.